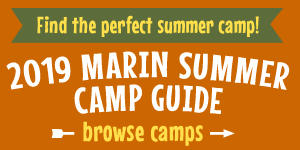 Registration is now open for Marin's popular Slide Ranch Summer Day Camp, with sessions taking place from June 10 through August 16, 2019 at their spectacular seaside location in Muir Beach. Camps at Slide Ranch give kids a unique opportunity to get hands-on experience on a working farm and also explore the natural world surrounding the ranch. Slide Ranch offers a variety of nature-based camps geared for a wide range of age groups including Ranch Rangers (ages 5 to 13), Slide Explorers (ages 5 to 8), and Junior Farmers (ages 8 to 13), Junior Environmental Educators (14–18), and Teen Camp (16 to 18). Slide Ranch Day Camp emphasizes hands-on experience and exploration of the farm and the surrounding countryside. Programs encourage campers to touch, taste, smell, hear, observe, and ask questions. Camp at Slide Ranch focuses on teaching respect for animals, plants, the earth, and each other. Slide Ranch campers milk goats, collect eggs from chickens and ducks, card and spin wool, create nature-based crafts, learn to compost, plant seeds, harvest and cook from the ranch's organic garden, and explore the tide pools and trails of the surrounding coastal wild lands. Slide Ranch teachers-in-residence each lead small age-based groups of approximately eight campers, tailoring activities to the interests, ages, and needs of the campers in their groups. Camp day begins at 9 am and ends at 2 or 3 pm, depending on the week and program. Campers will receive a t-shirt and photo with their camp group. 2019 camp fees are $450 per week for Slide Explorers and Ranch Rangers, $475 per week for Junior Farmers, $100 per week for Junior Environmental Educators, and $350 for Teen Camp. Scholarships, awarded on the basis of need and availability, are available for low-income families; interested families must complete a scholarship application before registering for camp. If you're interested in camp at Slide Ranch, sign up soon, as camps always sell out. If a camp that you're interested is already full, you can sign up for the waiting list. Aftercare, supervised by Slide Ranch teachers, is available Monday through Thursday until 5 pm for an additional hourly fee. Aftercare features outdoor activities and projects for all ages ranges. Slide Ranch offers a 50% sibling discount on aftercare. Slide Ranch, located in the Golden Gate National Recreation Area near Muir Beach, is extremely popular and offers limited enrollment—all there programs usually sell out—so register early! Learn more and register online at slideranch.org. Founded in 1970, Slide Ranch is a 501(c)3 non-profit teaching farm located at an historic dairy ranch perched above the ocean. The farm features a turn-of-the-century farmhouse, an old creamery, organic gardens, goats, sheep, chickens, and ducks, as well as access to miles of trails, tide pools, and beaches. It's the perfect place for hands-on environmental education!